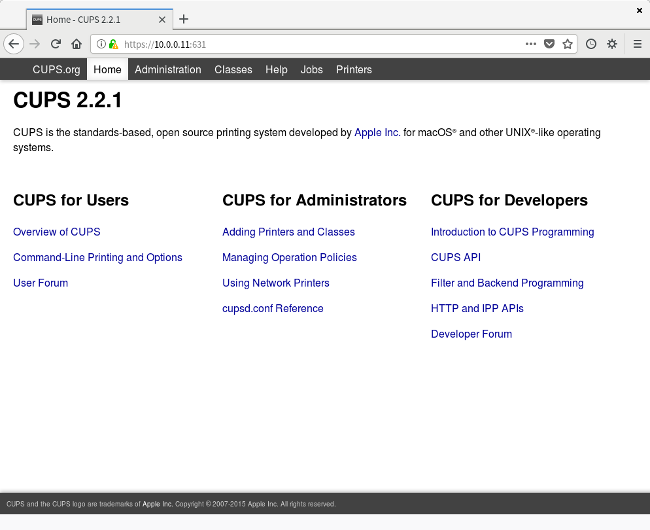 Network your printer with a Raspberry Pi and the CUPS print server. I like to work on small projects at home, so this year I picked up a Raspberry Pi 3 Model B, a great model for home hobbyists like me. With built-in wireless on the Raspberry Pi 3 Model B, I can connect the Pi to my home network without a cable. This makes it really easy to put the Raspberry Pi to use right where it is needed. At our house, my wife and I both have laptops, but we have just one printer: a slightly used HP Color LaserJet. Because our printer doesn't have a wireless card and can't connect to wireless networks, we usually leave the LaserJet connected to my laptop, since I do most of the printing. While that arrangement works most of the time, sometimes my wife would like to print something without having to go through me. I realized we really needed a solution to connect the printer to the wireless network so both of us could print to it whenever we wanted. 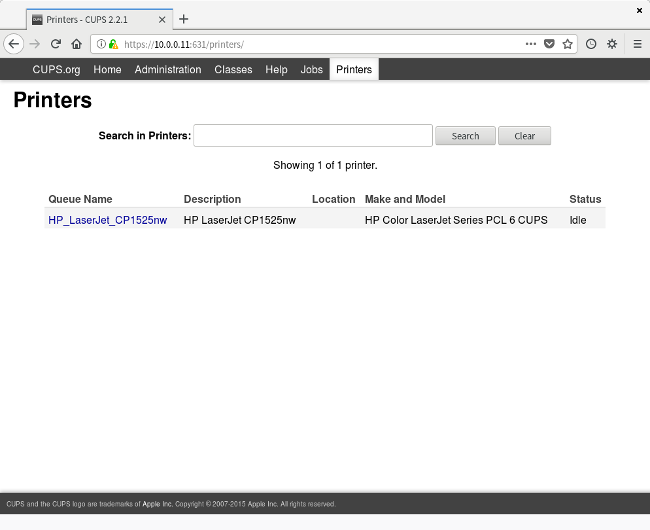 I could buy a wireless print server to connect the USB printer to the wireless network, but I decided instead to use my Raspberry Pi to build a print server to make the LaserJet available to anyone in our house. Setting up the Raspberry Pi is fairly straightforward. I downloaded the Raspbian image and wrote that to my microSD card. Then, I booted the Raspberry Pi with an HDMI display, a USB keyboard, and a USB mouse. With that, I was ready to go! The Raspbian system automatically boots into a graphical desktop environment where I performed most of the basic setup: setting the keyboard language, connecting to my wireless network, setting the password for the regular user account (pi), and setting the password for the system administrator account (root). I don't plan to use the Raspberry Pi as a desktop system. I only want to use it remotely from my regular Linux computer. So, I also used Raspbian's graphical administration tool to set the Raspberry Pi to boot into console mode, but not to automatically login as the pi user. Before I rebooted again, I made sure that the secure shell daemon (SSHD) was running (you can set what services start at boot-up in Preferences). This allowed me to use a secure shell (SSH) client from my regular Linux system to connect to the Raspberry Pi over the network. Now that my Raspberry Pi was on the network, I did the rest of the setup remotely, using SSH, from my regular Linux desktop machine. Make sure your printer is connected to the Raspberry Pi before taking the following steps. From there, navigate to the Administration tab, and select Add Printer. 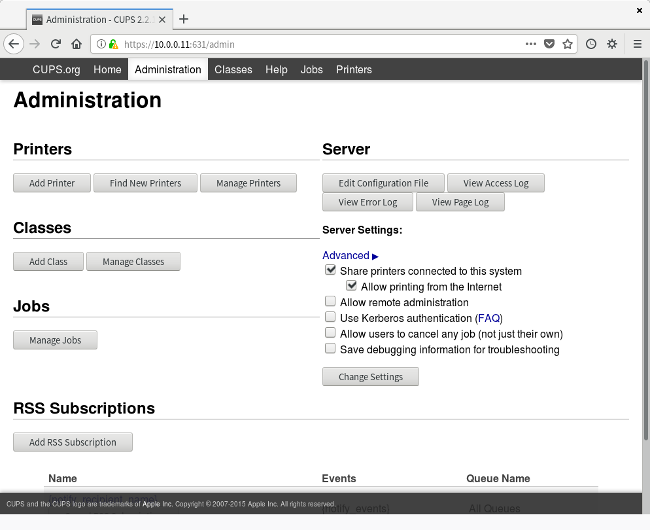 Setting up a network printer from the Linux desktop should be quite simple. My desktop is GNOME, and you can add the network printer right from the GNOME Settings application. Just navigate to Devices and Printers and unlock the panel. Click on the Add button to add the printer. On my system, GNOME Settings automatically discovered the network printer and added it. If that doesn't happen for you, you may need to add the IP address for your Raspberry Pi to manually add the printer. And that's it! 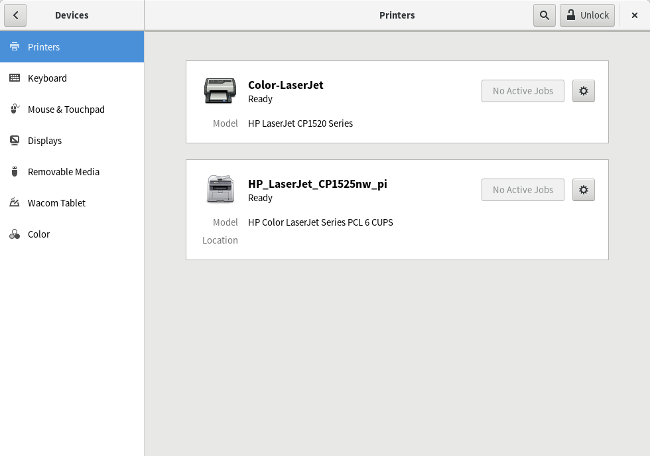 We are now able to print to the Color LaserJet over the wireless network from wherever we are in the house. I no longer need to be physically connected to the printer, and everyone in the family can print on their own. Overkill. Maybe with a Raspberry Pi Zero W, which can be picked up for $20 on Amazon, $10 on dedicated hobbyist sites. (Prime vs shipping charges makes this a harder decision than it looks.) If I wanted challenge as a newbie, I'd try to print from an Arduino. But with both boards there is an issue of proprietary bootloaders. I'd rather a Libre computer board AML-s905x-cc. It's about as cheap as RPi, and uses Open Firmware, (incl Libre Firmware?) for booting. BIOS is a "last frontier" of sorts for Open Source, might as well explore it. Jim, how do you find the performance of the Pi as print server? I gave up on using a 256MB Model B, but now have a 2B available ( having replaced that with a 3B days before the 3B+ came out :( - and I bought the B days before the 512MB version was released, so feel a bit jinxed! ).